Reinforcement learning has seen many successes in the last years, enabling computers to beat human masters at such difficult tasks as Go and Atari games. In addition, reinforcement learning is showing great promise in creating exciting consumer facing technologies such as self driving cars, while also driving behind the scenes efficiency gains with self learning recommendation and pricing systems. Yet despite all these gains there are major challenges still out there. For one we have the issue of sample efficiency, the alphaGo computer had to play 5.4 * 10^9 games to train. Even if Jesus after his resurrection had set his mind to learning Go and played the game at an ungodly rate of 5 matches a minute ever since, he still wouldn’t have played as many games as the AlphaGo computer during training. So clearly state-of-the-art reinforcement learning methods are able to beat human masters, they must play many more games than the human master practiced with. The Go master still beats the computer in sample efficiency. This issue becomes more pronounced when samples are expensive. One example is robot control: there a sample is obtained by letting the robot move around, which can take a few minutes to gather a sample. Clearly if we’re in the regime where 10^9 samples are required, the robot will probably not be trained before the four horsemen of the apocalypse show up and ruin the experiment. 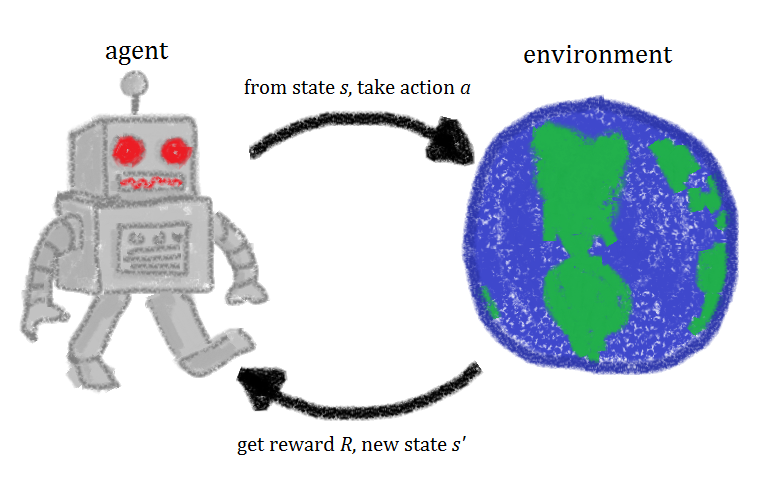 One reason sample efficiency is so difficult is because these are all delayed reward environments where the reward becomes apparent only after a bunch of interactions with the environment. With Q learning, it’s been shown that reward delay exponentially increases the time it takes to reduce the bias of the learned Q-function. In order to address this issue, many approaches craft an auxiliary reward structures for the agent. For example, in chess the agent can gain reward by capturing opposing pieces, lose if by having his pieces captured. In this way the agent learns the intermediate goal of capturing opposing pieces which is generally necessary to achieve the actual goal: checkmate. While the approach gets good results in specific domains, for every new domain the agent wishes to learn a new reward structure must be crafted by hand, and in many cases not enough knowledge exists about the domain to hand craft such a good reward structure. In addition, this puts an unnecessary upper limit on the performance of the whole system by introducing a target which is not aligned with the (generally unknown) best policy. Therefore, in order to better understand this problem we’re researching bounds on sample efficiency in simple, delayed reward settings, both minimax lower bounds for all methods and concrete upper bounds for popular methods. With these bounds in hand, we can understand the weaknesses in current methods and hopefully find new methods that get close to lower bounds.